Great Linford Railway Bridge No 76A (disused) is a major waterways place minor waterways place place on the waterways major waterways place village town city on the Grand Union Canal (Grand Junction Canal - Main Line - Gayton to Brentford) between New Bradwell Footbridge No 71B (1 mile and 7¼ furlongs to the west) and Bridge No 78B (Grand Junction Canal) (1 mile and 1½ furlongs to the east). The nearest place in the direction of New Bradwell Footbridge No 71B is The Black Horse PH (Great Linford); ¾ furlongs away. 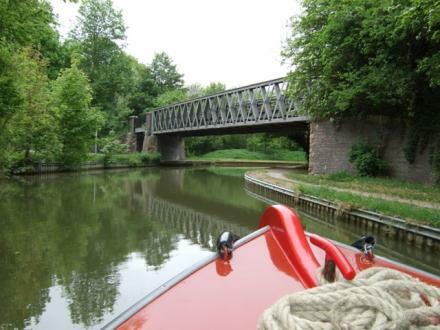 The nearest place in the direction of Bridge No 78B (Grand Junction Canal) is Linford Manor Park Visitor Mooring (48 hour mooring); 2½ furlongs away. Milton Keynes Business Center, Foxhunter Dr,, Milton Keynes, MK14 6GD — 1629 yards to the south. Unit 206, Milton Keynes Business Centre, Hayley Court, Linford Wood, Milton Keynes, MK14 6GD — 1523 yards to the south. Milton Keynes Business Centre, Fox Hunter Drive, Linford Wood, Milton Keynes, MK14 6GD — 1532 yards to the south. Parc Farm, Little Linford Lane, Milton Keynes, MK14 5AH — 482 yards to the north. milton keynes, Buckingham, MK137BP — 1403 yards to the southwest. Great Linford, Milton Keynes, MK14 5DU — 1180 yards to the southeast. Milton Keynes Business Centre, Milton Keynes, MK14 6GD — 1591 yards to the south. Suite 8, Milton Keynes Business Center, Milton Keynes, MK14 6GD — 1573 yards to the south. Lower Stonehayes,Great Linford, Milton Keynes — 1487 yards to the southeast. 106, MIlton Keynes Business Centre, Milton Keynes, MK14 6GD — 1535 yards to the south. Milton Keynes — 1570 yards to the southeast. Top Fair Furlong, Milton Keynes, MK14 — 1424 yards to the northeast. 41 Harrowden, Milton Keynes, MK137BX — 1336 yards to the southwest. Great Linford — 533 yards to the south. Kingsfold, Milton Keynes, MK13 7BN — 1520 yards to the southwest. Wolverton Road, Great Linford, MK14 5AH — 497 yards to the north. Milton Keynes — 1450 yards to the south. Milton Keynes — 1073 yards to the southwest. Thornton Chase, Milton Keynes, MK146FD — 1463 yards to the south. Home, Milton Keynes — 798 yards to the west. Milton Keynes — 1157 yards to the southwest. Great Linford MK14 5DZ, Milton Keynes, MK14 5DZ — 736 yards to the east. giffard park, Milton Keynes, 0000 — 1366 yards to the east. Stantonbury Campus, Milton Keynes, MK14 6BN — 1380 yards to the south. Great Linford primary school, Milton Keynes, MK14 5BL — 684 yards to the southeast. Stantonbury, Milton Keynes, MK14 6BN — 1530 yards to the south. Parklands, Milton Keynes, MK14 5AU — 272 yards to the southeast. Unit 205, Milton Keynes Business Centre, Foxhunter Drive, Linford Wood East,, Milton Keynes, MK14 6GD — 1538 yards to the south. Milton Keynes — 1330 yards to the south. Stantonbury — 967 yards to the south. Milton Keynes — 1495 yards to the southwest. 33 Broadway Avenue, Milton Keynes, MK14 5QB — 1178 yards to the east. Silverstone — 1623 yards to the northeast. Stantonbury Campus, Milton Keynes, MK14 6BN — 1521 yards to the south. Unit 403 Milton Keynes Business Centre, Foxhunter Drive, Milton Keynes, MK14 6GD — 1570 yards to the south.